Make your way to the Milford Sound Visitor Centre, where you’re welcomed aboard the vessel by your captain. 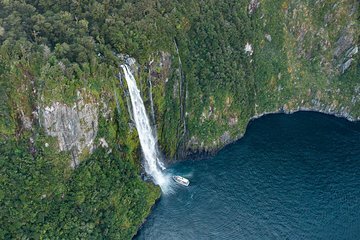 This Milford Sound cruise boat holds a maximum capacity of just 75 people — less than half the capacity of the average tour — allowing for a more intimate group. Sip a hot cup of coffee or tea, and take advantage of spacious outdoor decks or the warm indoor seating with large viewing windows. Throughout your 2.25-hour cruise, you’ll motor past glacier-carved rock walls, such as the 5,550-foot (1,692-meter) Mitre Peak, jutting up from the fiord. Due to the boat’s smaller size, your captain comes close enough to the tumbling waterfalls to offer a taste of the pure waters from the frothy cascades. Search for fur seals, bottlenose dolphins and Fiordland crested penguins as you listen to commentary about this postcard-perfect landscape in the World Heritage–listed Fiordland National Park. At the end of the cruise, your captain returns you to the Visitor Centre. Milford Sound is unique and very beautiful and the cruise enabled us to make the most of it. The boat was comfortable and the commentary was good. It was a wonderful experience and we thoroughly enjoyed it. It was drizzling with rain on the day but this enhanced the experience as lots of waterfalls were running. It was probably the highlight of our trip to NZ. Unfortunately when we arrived at Milford Sound, it was raining heavily, the visibility was zero and we had to park 10mins walk away to the terminal. I asked at the information centre about whether the cruise was still happening and if a shuttle bus was available and the answer was the cruise was still happening and we would have to walk through the rain. We decided to forfeit the money we had paid as the entire trip would have been wet and uncomfortable. Elderly people would happily pay extra for a shuttle rather than stumble through uncertain wet ground. The nature cruise was informative and beautiful. We saw fur seals, dolphins, and two Fiordland Crested penguins! Great fun to drink water from a waterfall, see the Tasman Sea, and have the opportunity to don raincoats and stand under a waterfall. Wow ... this was a simply awe inspiring ride ... the cruise guys were amazing, the food/drink bar was simple but I still enjoyed some stuff from there. Milford Sound was simply amazing, the cruise spent the time to stop and circle around when something interesting Seals basking in the sun, Kingfish jumping out of the water was happening. Guides were knowledgeable, friendly and entertaining, cruise boat was really nice. Simply unforgettable experience. Great tour - We got lucky with good weather and got to see penguins and seals! A nature cruise is the best way to see Milford Sound. Even though it was raining it was one of the most memorable trips I have been on. Crew/Staff was friendly and insightful. I would highly recommend to anyone. The Nature Cruise in Milford Sound was sepctacular! The guide was very informative and friendly. The cruise was slow and graceful. You are constantly in awe of the majestic nature with it's dramatic flair around you. Love it and will recommend it to everyone.